With the wide variety of options, styles and colors of lanyards available here at All About Lanyards, we offer just as much choice in attachments and accessories for your custom lanyard order. With every order custom lanyards comes your choice of one of our standard attachments shown above. We selected these specific attachment options due to their popularity. Most likely one of the standard attachments will suit your specific application. For that unique, special look to finish off your custom lanyard order we provide these upgraded attachments at a slightly extra cost. Though our standard attachment hooks and clips offer a very secure hold the upgraded attachments like the carabiner and oval hook are made of stronger spring mechanisms and much thicker metal. Those two additional features brings an extra level of security for badges, IDs and other items that you might clip onto your lanyard. Another unique feature from our line of upgraded attachments is the non-swiveling hook. No more fuss with a backwards badge or a twister lanyard, the non-swivel hook comes with no swivel point - hence the name. Clip on your badge and it will stay put facing outwards like it should. Read on for even more offerings from All About Lanyards for your custom lanyard order! Your custom lanyard wouldn't be complete until you consider one of our lanyard accessories. For an easy removal of your ID badge the buckle release was made, a simple pinch of the sides of the buckle will release the attachment from lanyard. If you have to swipe your card there is the retractable badge reel which attaches to a split key ring lanyard attachment. 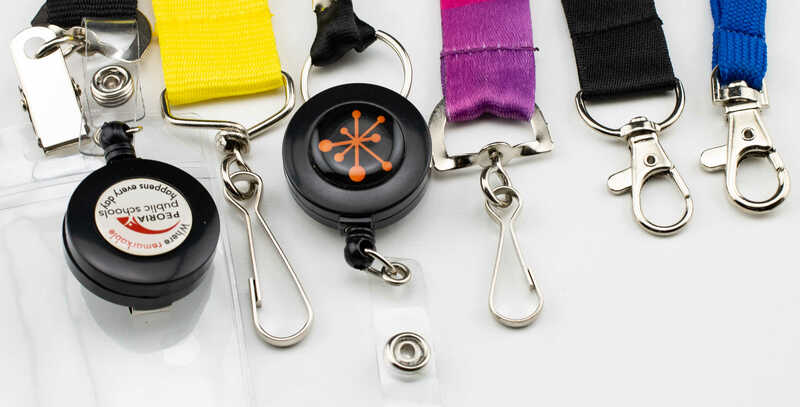 The rectratable badge reel has a string that attaches to your ID badge and the string is wound onto a spring loaded mechanism to allow your ID badge to be quickly retracted to your lanyard when pulled from the reel. If you happen to use your lanyards around children then the velco or plastic safety breakaways should be considered. With enough tension and force the lanyard will "break" at the velco or plastic connection point so your lanyard will never accidently end up as a hazard to anyone. We also offer badge holders of varing sizes that can attached to a hook or clip. Our clear plastic badge holders will thoroughly protect your ID cards from the elements but can also be used to hold business cards and perhaps hook your pens to.